our client recently hired Risher+Martin Fine Homes to provide pre-construction services and ultimately, build their multi-million dollar, forever, custom home. A tall order for any builder, and with a mountain of expectations....this team provided a level of professionalism, service, communication, and quality of the highest level. It was an absolute pleasure showing up for weekly job site meetings, observing the respect and honesty they gave to our client and their property, and witnessing the dedication they provided to execute a complex modern design with precision and grace. Risher+Martin is an absolute must for your next build, and we would be thrilled to have them build any of our future designs.....expectations exceeded! 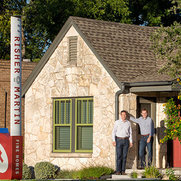 We love working with Risher | Martin Fine Homes. The entire process from start to finish - during our design time through construction administration - was a outstanding experience from the architectural side of things. 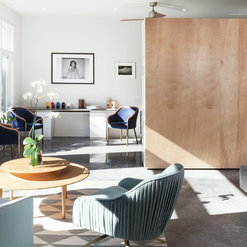 It always felt like a true collaboration to get the budget dialed in and they were focused on design intention, which is rare in a General Contractor. The crew is professional, knowledgeable, and friendly and we can't wait to work with them again. It’s all about people. Jeremy and Chris and the office team are the first connections, ambassadors. Once working with RM, your project manager becomes a highly trusted, positive champion of your new home, and maintains cordial relationships with your neighbors. The subs are eager to be responsive. The suppliers know your budget and priorities and have reviewed your plans before you visit the showroom. RM are positive and confident due to their experience, not due to a Pollyanna need to impress. Their aim is to build a fabulous house AND a lifelong relationship. They are 100% reliable and go beyond duty to make things right. RM should patent their process—they advise the architects early in the design phase which saves you time and money. They walk you through the entire construction plan and help you make all selections upfront. Then provide a fixed price that makes the actual construction period far more efficient and on-time (despite 29 days of straight rain early on). Personal attention is given to every request and change order, alleviating anxiety and making the process both educational and fun. Here is an example of creative collaboration between client, architect and builder: We asked for a glassed-in dining room that juts out into the woods. Cantilevered over a ravine with floor to ceiling glass on three sides would be lovely but the cost was prohibitive. Instead, with respect to our budget and our aesthetic sense, RisherMartin and the architects (SBV) put their heads together and came up with an affordable and beautiful space which has attracted several design professionals with its wow factor. 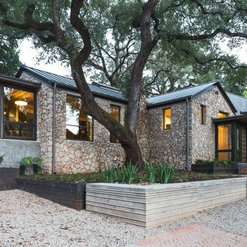 They made our house economical by imaginative use of materials, by skillfully siting the house on a narrow, wooded lot that had its share of city code and topographical challenges, and by adhering to a thoughtfully planned construction schedule. 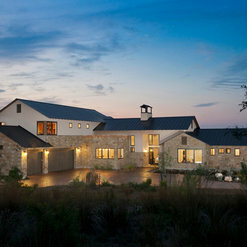 Great care was given to protecting the trees and creek, resulting in a unique home that magnifies the natural beauty of the lot. We hired RisherMartin to perform a light "refresh" on a home we purchased in mid-2010. This was far less than a renovation or remodel, but did involve repainting everything, refinishing floors, changing out light fixtures & controls, building and installing some new cabinetry in the master bath, a few energy efficiency updates, and replacing the kitchen sink with a larger one (which involved cutting the existing kitchen counter granite slab). Jeremy (Martin) and Chris (Risher) worked closely with us from the beginning, communicated clearly where the project stood throughout the process, and finished the project on-time and slightly under budget. My understanding is that our project was on the very small end of jobs for them, but they still gave it full time and attention and I wouldn't hesitate to recommend them for any project, as they doubtless bring the same level of attention to detail and service to more complicated jobs as well. RisherMartin is a knowledgeable, professional and fun group of people to work with. They do a great variety of projects and they always turn out beautifully. 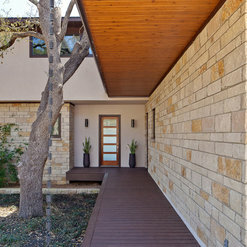 One of the most interesting projects we worked on was a house in Austin which was completely built from concrete - floors, walls, and even the roof. We had to work together to come up with solutions to issues we'd never dealt with before, like how do we handle an expansion joint around wood floor when the walls are stucco and have no baseboards? 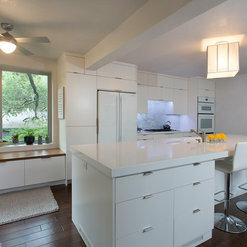 We recently completed a major remodel with R+M and are thrilled with the result. Chris and Jeremy were great in exploring feasibility and scope of our project to start out. We hired some terrific architects and had very effective joint planning meetings early on. We ended up adding kid space, a pool, and relocating the kitchen. Along with new plumbing, electrical and windows, it is a whole new house. All completed in 8 months, as promised! We had the majority of our selections made ahead of time for a realistic budget and really low stress during the project! James Golden was our project manager and he was consistently responsive and efficient, with real expertise in everything. I also greatly valued Chris for his opinion on aesthetics and gentle guidance in selections. We had weekly on site progress meetings with Chris and James that were always helpful. They had often found any concerns ahead of time and were ready with proposed solutions, even having work redone that was not up to their expectations. These guys are really knowledgeable, pleasant to work with and get quality results. They have a great system for moving a project along and we couldn't be happier with the results or give a higher recommendation. We were first acquainted with RisherMartin Fine Homes while working with a client for a substantial remodel and addition project. The client had actually engaged them before engaging us and hoped we would be able to work together. 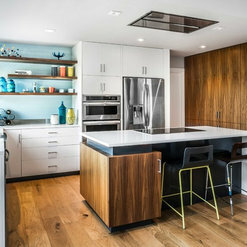 We quickly learned that RisherMartin Fine Homes shared with us the same philosphies towards design, construction, and above all, a team approach to both. Needless to say, the project was a success that culminated in a design that was beautifully executed and a client that has promised to be a reference for life! Since then, we have highly recommended RisherMartin Fine Homes to our clients for any and all types of remodel, addition, and new construction projects and will continue to do so. 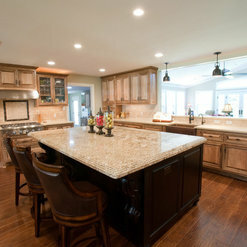 They are professional, courteous, and highly skilled at providing quality construction that meets budget and schedule. As an architect, I have been associated with Risher Martin Fine Homes on several projects and would unequivocally recommend them as a builder for your new or remodel residential project. I have found them to be well organized, efficient and very sensitive to project budgets and schedules while producing an outstanding, high quality product throughout the process. 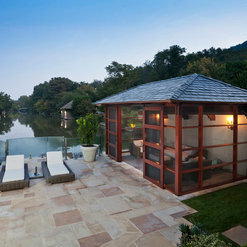 They are not only talented and skillful contractors, they are good people. It was quickly evident to me that they are truly fast-rising superstars in our field, and their recent industry accolades have confirmed that ascending position. I thoroughly enjoy working with them and look forward to a continuing personal and professional relationship and will recommend them without hesitation to my clients. Commented: window manufacturer?These are Marvin aluminum clad windows. Commented: Well hidden range hoodHi Brenda, This is a Zephyr Power Pack insert. Let me know if you have any other questions. Commented: Love the cabinet drawers. Manufacturer? Material? teak veneer?These are standard American Walnut. Commented: These floors are beautiful. Did you use dark walnut or special walnutThank you! 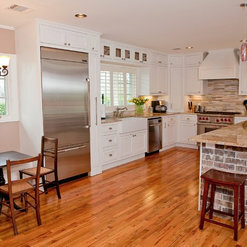 This floor is actually a red oak with a walnut colored stain. 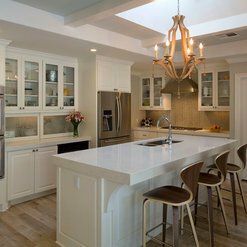 Commented: Where can I buy the chandelier please?This chandelier came from Lighting, Inc. in Austin, Texas. 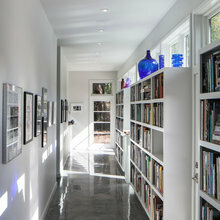 Check out their online gallery at lightinginc.com.